Southern Maine is one of my favorite places to explore. 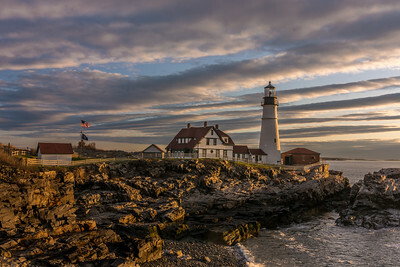 Lighthouses, rocky coasts, beaches, lobster boats and more. Taken at sunrise, just before 5am. The light on the rocks was magical and mystcial and breathtaking beautiful. Mother Nature helped out with the clouds steaking in the background to make it a perfect morning to witness the scene. Maine and rocks. Having grown up on NH, I visited Maine alot and as a child loved exploring the rocky coastline. 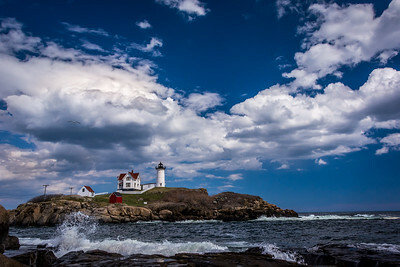 Here with a wide angle lens I created an image that shows the expanse and the beatufy of the rocky Maine coastline. These lighted stools caught my eye as I walked past them at Old Orchard Beach. Another puddle reflection in a vertical format. This is actaully reflected in a puddle. I was laying down on my stomach with my camera almost touching the puddle to take the shot. The Blue Hour - just after sunset - The Old wooden pier at Old Orrchard Beach. Perkins Cove, Maine just before sunrise - 4 AM. This was taken with a cell phone and is only sutiable for cards, small prints and small-medium canvases. The light was picture perfect on this little red shack in this harbor in MId-Coast Maine.